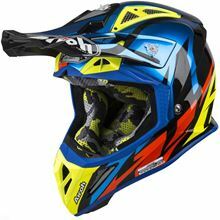 The Airoh Aviator 2.2 was without a doubt the most popular helmet among professional MX and enduro riders. Following on from that success Airoh made significant improvements for the Aviator 2.3. Airoh developed and patented the new AMSS system, which reduces the rotational acceleration transmitted to the user. The AMSS system consists of two different density shells connected together by means of a rubber damping ring on a central pin and by means of a set of rubber elements placed between the two shells. These highly elastic elements support the shells during heavy-duty performance. The Aviator 2.3 features the proven Carbon/Kevlar blended shell in two sizes for superior lightweight comfort. The interior lining has been upgraded and now features magnetic inner liner fittings for rapid removal, the cheek pads feature Airoh’s AEFR emergency cheek pad removal system. The seriously effective venting scheme remains as well and the covers and peak extender and there is a go pro mount included. Powered by nopCommerce Copyright © 2019 Motogear. All rights reserved.